The confluence of fall, food, fun, and football is here. It’s called tailgating, and as far as we can tell, it’s a uniquely American phenomenon. According to the polling organization govyou.com, some 27 million of us will attend weekend tailgate parties in the last quarter of the year with millions more entertaining at home (“homegating”). If you’re part of this glorious and fanatical culture, you know how competitive the sport of tailgating is. Anyone can wear their team colors and accessorize with foam fingers, but it takes gumption and guts to set up a field kitchen in a parking lot and play host all day and into the night. It takes good equipment, too. 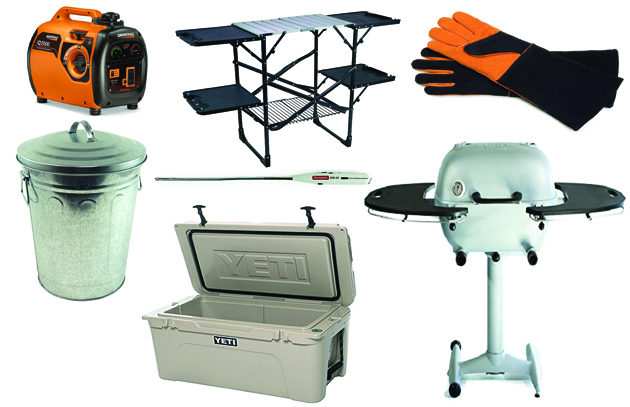 Below are tailgating finds that will prove you’re at the top of your game. You’re welcome. We love equipment that can do double-duty. At your service is this 8- by 2-foot table that emerges from a compact aluminum briefcase. Use as a buffet table or work counter during the barbecue (its melamine surface is waterproof), and when the feast is cleared, organize a friendly game of pong. Available in four motifs—football, the American flag, black, or a custom dry erase. Six pong balls are included. Don the gloves of a warrior and let the grilling competition begin! Designed by Steven, these handsome 18-inch suede gloves give you protection from radiant heat up to the elbow. Flexible, but dexterous. Perfect for reaching across a loaded grill or throwing another chimney full of coals on the fire. Recommended by Cook’s Illustrated. New in 2017, the award-winning PK360 charcoal grill is the distillation of 40 years of experience accumulated by this Arkansas-based grill company. Yes, it weighs 91 pounds. But the cast aluminum firebox detaches from the base for easier portability. Superb heat control is provided by four vents, so you can maintain temperatures from 180 to 700 degrees for hours. Too many features to mention here, but know the PK360 comes with a 10-year warranty. Rugged, roomy, and with a cool factor that’s off the charts, we like to think of this as the Cadillac of ice chests. Sturdy enough to sit or stand on, the YETI (named after the legendary monster of the frozen tundra) will keep your food and/or beverages iced for days—important whether you’re traveling to a distant sporting event or hosting a tailgate party on your home turf. So well constructed it’s certified to be bear-resistant. It comes with a dry goods basket. This eminently portable (and relatively quiet) generator is perfect for tailgating, camping, or other outdoor gatherings. Features dial-in Economy, Standard, and Turbo modes to adjust to your electrical needs. That fancy margarita blender you’ve been dying to use could conceivably be powered for up to 7 hours by the Generac. An LED dashboard displays fuel level, remaining run-time, wattage use, and status. An optional kit allows you to couple two of the units together for even more power. Sometimes, it’s the little things. Like this refillable gas match that doesn’t blow out in windy conditions thanks to its continuous ignition system. (And we know there can be windy conditions in parking lots on game day, not all of them created by Mother Nature!) It features a 15-inch flex extender for hard-to-reach places. The flame is adjustable. The unit arrives empty, so fill it with butane before your party. Also requires an AA battery, which is included. This is one of America’s favorite “grab it and go” portable grills, just the thing when your party is small or you need extra grill space. With 240 inches of cooking space on its stainless steel grill grate, the Jumbo Joe is best-suited for direct grilling. A wire bale secures the lid. Weighs less than 18 pounds. An outdoor kitchen needs flat spots—a place to accumulate barbecue tools, hold rubs or sauces, and of course, set your beer. This cook station is equipped with a heat-resistant aluminum countertop, a lower rack, and four fold-out side tables for plenty of space. Hassle-free set-up and break-down. The unit, which weighs, 18.9 pounds, supports up to 300 pounds. Stake your claim on the asphalt with a canopy that sets up in 3 minutes. This 10- by 10-foot Coleman canopy provides 100 square feet of vented cover with a center height of 8 feet. Breaks down easily thanks to a push button release lever and packs compactly in a wheeled carry bag (included). An optional sunwall and canopy weights are available.